Four Civil War subversives—who happened to be women—garner a lively treatment. Having previously written on Gypsy Rose Lee (American Rose) and the Everleigh brothel in turn-of-the-century Chicago (Sin in the Second City), Abbott finds some sympathetic, fiery characters in these four women who managed to aid their causes, either North or South, in their own particular ways. Belle Boyd, a 17-year-old farmer’s daughter from Martinsburg, Virginia, which had voted three to one against secession, declared her loyalty to the Southern cause by shooting a Yankee soldier who dared to touch her mother, and thereby took advantage of the confusion and movement of troops to slip through the lines and pass secrets; she was in and out of jail during the course of the war. Emma Edmonds, having left the family farm in 1859 to reinvent herself as a man selling Bibles door to door, offered herself to the Union cause two years later, serving mostly in a medical capacity. According to Abbott, Edmonds was one of 400 women, Northern and Southern, who posed as men. Rose Greenhow, a comely widow and grieving mother of some means in Washington, D.C., fashioned herself as a spy for the Southern cause, learning code, passing messages wound in her servants’ hair and inviting all kinds of late-night gentlemen callers; Greenhow would eventually go abroad to drum up sympathy for the Confederacy in England and France, turning her charms on Napoleon III and others. 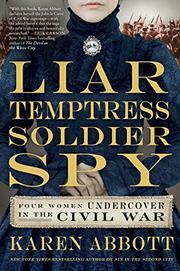 A wealthy Richmond spinster, Elizabeth Van Lew had deep Yankee roots in her family and was unique in that she cultivated intricate subterfuge right under her Southern neighbors’ noses—e.g., passing Confederate troops movements to Gen. Benjamin Butler. Abbott proceeds chronologically, navigating the historical record through quotes and personal detail. Remarkable, brave lives rendered in a fluidly readable, even romantic history lesson.